“I’m an old school advisor,” A&S Academic Advisor Joe Lewis said as he explained why his office door is always open. For Lewis “old school” means being a helpful resource for students, being familiar with their academic history, and helping them meet their graduation goals. The A&S Office of Advising has made being “old school” much more effective by introducing “new school” technology. The office handles more than 7,000 student appointments in the academic year. During priority registration, they can have more than 100 students a day with up to 30 students at one time waiting to see one of the College’s ten advisors. Communication between the front desk and advisors “became the classic Abbot and Costello ‘Who’s on first, what’s on second?’ situation,” as Travis McKenzie, director of the Project Management Office, put it. “Students come first and we strive to explore new strategies that will positively affect the student experience,” McKenzie said. With these guiding principles, McKenzie drew a model of what he imagined would help and brought it to programmers in the Hive, A&S’s Creative and Technical Services. Hive students, which included senior computer science majors Timothy Parrott and Anton Vinogradov, and Aly Shehata, a junior in computer engineering, brainstormed the concept and developed a two-part web app: a touch-screen kiosk for students to sign in and a backend interface for communication and coordination with the advising staff. The new system was implemented August 2014 and the benefits were immediately felt by students and staff alike. 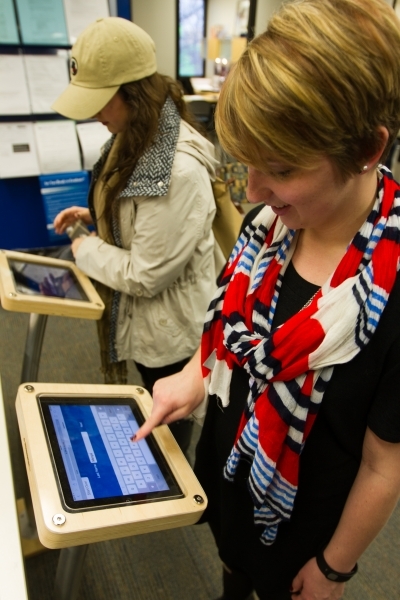 The data collected through the digital sign-in allows for self-assessment and analysis. With this application, the Advising Office has determined which days and times are the most popular, why students are coming in, what the average wait time is, and more. “Adding to our advising infrastructure is another way we are looking to improve student success in the College. We are making sure students have access to the tools they need to succeed,” said Mark Kornbluh, Dean of the College of Arts & Sciences. Part of the process has been to digitize thousands of students’ files. Traditionally, these files have been paper-based and kept in physical folders in various offices. Tracking down those files could take days. Now, A&S is working to make all of the data available for advisors and staff at the click of a button. Stephanie Morris, A&S project manager and student employee advocate, manages the staffing of the on-going digitization project. A&S student employees Carlos Guitierez, chemistry junior; Brooke Kuerzi, biology junior; and Kristina Moyers, chemical engineering junior; have been scanning the records to a secure share drive. The College looks forward to a time when all resources on campus can be integrated with readily accessible student information as it continues to improve upon student success. “Being a resource person does not mean that I have every answer to every question, but it does mean I know where to start. Having readily accessible digital information is an important part of the process,” Lewis said. In many ways, providing customer service for students in the College of Arts & Sciences means pairing “old school” advising with “new school” technology.